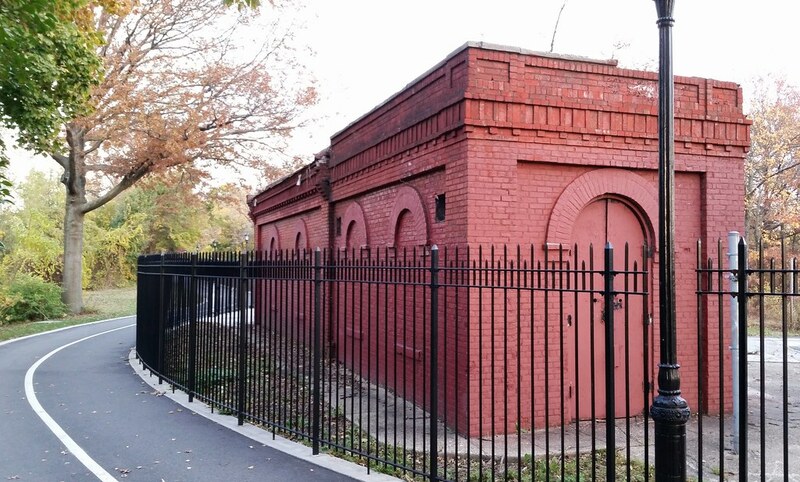 Located at the northern end of the Ridgewood Reservoir, between the two original basins that went into operation in 1858, this building stands atop the sluice gates that controlled the amount of water leaving those basins. The water would pass through the sluices into an effluent chamber, where it would enter the pipes of the distribution system and be carried down to the people of Brooklyn. The water space of the effluent chamber is connected by passages eleven feet wide, with the two divisions of the reservoir. A heavy granite wall is built across each passage, rising to the same level as the top of the reservoir banks. In each wall there are four openings, the two lower openings being 3x3 each, and the two upper openings 3x4 each. Iron sluices running in iron slides, faced with composition metal, cover and control these openings. From these sluices, iron rods of two inches diameter rise to the top of the work, where they terminate in screws and gearing for the movement of these sluices. [Two hand-wheels for controlling the sluice gates can still be found behind the gatehouse.] . . . In front of the sluices, towards the reservoir, in each passage, copper wire screens are placed, twenty-two feet in height, to prevent fish, leaves, &c., from passing into the effluent chamber, and so into the supply pipes. . . . The apparatus for moving the sluices is protected by a small house built over each passage.